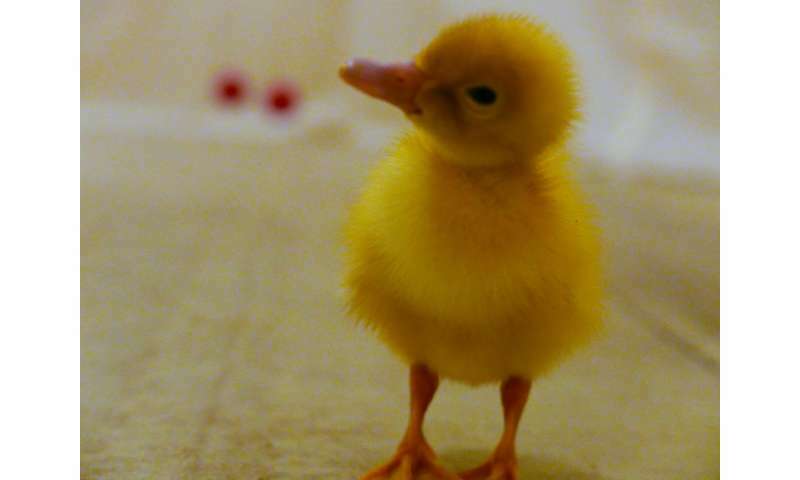 Scientists from the University of Oxford have shown that newly hatched ducklings can readily acquire the concepts of 'same' and 'different' - an ability previously known only in highly intelligent animals such as apes, crows and parrots. In this new study, published in the journal Science, ducklings were initially presented with a pair of objects either the same as or different from each other - in shape or in colour - which moved in a circular path. Professor Alex Kacelnik of Oxford University's Department of Zoology, who has worked extensively on learning and decision-making in animals, said: "To our knowledge this is the first demonstration of a non-human organism learning to discriminate between abstract relational concepts without any reinforcement training. The other animals that have demonstrated this ability have all done so by being repeatedly rewarded for correct performance, while our ducklings did it spontaneously, thanks to their predisposition to imprint when very young. 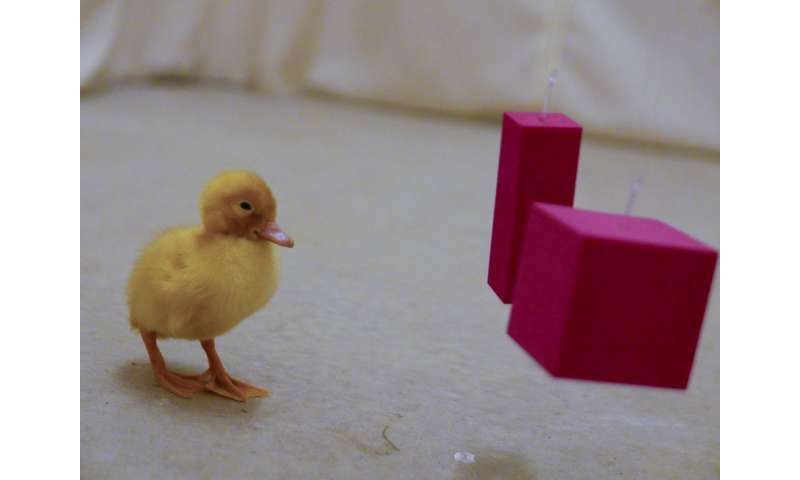 "And because imprinting happens so quickly, the ducklings learned to discriminate relational concepts much faster than other species, and with a similar level of precision." Antone Martinho, a doctoral student in Oxford's Department of Zoology and the study's first author, said: "While it seems surprising at first that these one-day-old ducklings can learn something that normally only very intelligent species can do, it also makes biological sense. When a duckling is young, it needs to be able to stay near its mother for protection, and an error in identifying her could be fatal. "Ducks walk, swim and fly, and are constantly changing their exact shape and appearance as they extend their wings or become partially submerged, or even change angle with respect to the viewer. If the ducklings just had a visual "snapshot" of their mother, they would lose her. They need to be able to flexibly and reliably identify her, and a library of concepts and characteristics describing her is a much more efficient way to do so, compared with a visual memory of every possible configuration of the mother and her environment. "Still, this is an unexpected feat for a duckling, and a further reminder that "bird-brain" is quite an unfair slur." Professor Kacelnik added: "It may mean that relational concepts are adaptively useful or even necessary to a wider variety of animal. Most animals will, like the ducklings, need identification mechanisms that are robust to natural variation. A challenge we face now is to identify the processes by which the animals' brains achieve it." Well then, ducks should be given the right to vote. The belief that animals might not be able to distinguish between the same or different indicates an ignorance on the part of an observer.